Not gardening today. Took Zoey for a walk in the Hembree Park and that looks like about all I get done outside today. I did water the greenhouse as I have a bunch of tender little plants to guard against the mid 90F heat. Other than that I am going to work on pictures and stuff where I can sit in the cool and drink iced tea. Took this shot of a couple of white tail the other day. There were actually three but one was very shy. It just amazes my that there are so many deer here in the middle of town. There are a few islands of woodland around but not that much. Lots of critters in the garden today. Nice cooling off from the last few days and we all enjoyed the morning. I actually remembered to take a real camera with me this morning instead of just the phone. The phone is an HTC M8 and has a pretty good camera but for stuff like close ups it can't match the Nikon D80. Got some good shots which I thought some you might enjoy. For thos interested the butterfly is an Eastern Tiger Swallowtail and there were three in the garden this morning. I was very excited to see the praying mantis and since he/she is from this season I would guess there are more and that means help with bad bugs. We are in the full "dog days" of summer now. Hot and humid here in Atlanta. The garden is looking pretty sad as things have made their big run and are now just tapering off. I'm beginning to remove some of the tomatoes and peppers to make room for the fall garden. Lots of stuff started in the green house and it should be ready to go into the ground in the next few weeks. The good news is that the forecast is for some cooler temperatures starting tomorrow. I've got the late summer beans for drying in and they are coming along fast in all this heat and humidity. These are the beans for leaving on the plant and letting dry for storage and seed for next year. I need to get out and get some work done before the heat gets unbearable but I did the big Sunday breakfast thing with biscuits, and bacon and eggs with baked beans so I'm a bit slow getting out of the blocks as you can imagine. Everyone enjoy the rest of the weekend. Here is an okra blossom for you to ponder. Depending on whose forecast you believe the next 5 or 6 days will see high temps in the 90's which is the first long hot series we have seen this year. It really has been a pretty cool summer so far. I probably won't be doing any afternoon gardening for the next few days but I'm pretty caught up anyway. All of the fall seeds are starting to appear, broccoli, cabbage, cauliflower, Chinese cabbage, Napa, are all up. The chard, beets and spinach haven't appeared yet but I expect them any day. My garlic bulbs should be showing up in the mail any day and I've got a bed ready for them. Has everyone got their fall gardening started? Yesterday was compost turning day which is a weekly task around these parts. As you can see from the picture I took yesterday at the completion of my efforts, I now have two full bins of black gold. 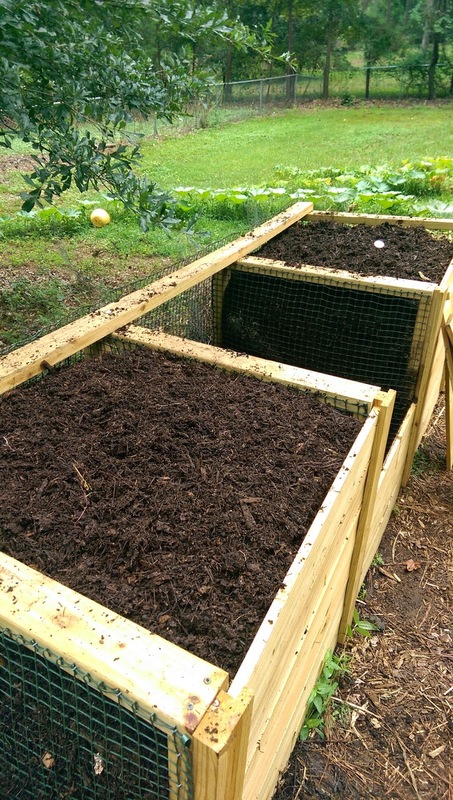 Each of those bins is a little over 3 ft. x 3 ft. x 3 ft. so that means 64 cubic feet of compost. I'm excited and I know you are too. It is almost ready to go back in the garden. The bin in the foreground still has some bits of un-composted corn stalk but that will be gone in a week or so. The center bin is now empty but there are several beds that need cleaning out as the butternut and acorn squash are finished as are the second crop of cukes and zukes. There are also some tomatoes that can be removed. Getting ready for the fall garden. Only supposed to see a high of 88F today and 0% chance of rain so we should get caught up with most of the garden chores without dying from the heat. It's already almost 0830 and I need to get cracking. 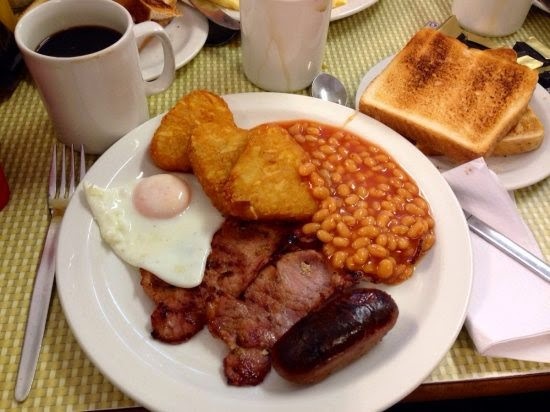 Saw this picture on The Chive today and it dawned on me that it has been ages since I had a proper fry up. Unfortunately, the only place I know to get English bacon and blood pudding is the British Shop in Norcross and I am going to have to think hard about a drive over there just for bacon. Though a good English breakfast on Sunday morning would be brilliant. And yes, all my English friends, I know that the tomatoes are missing as are the mushrooms but rest assured they won't be from my plate.